From 14-17 June 2017 SedNet organized its 10th International Conference in collaboration with DISTAV-University of Genoa. Approx. 150 sediment specialists participated to the event. The conference programme contained 12 sessions with oral presentations, and miscellaneous poster sessions. Abstracts and slides of (poster) presentations can be found on https://sednet.org/events/sednet-conference-2017/. To get a quick impression of all session results you can download the wrap-up presentations of session 12, the Plenary Closing Session. SedNet wishes to thank all the chairpersons, speakers, poster-presenters for their contributions, and the Local Organizing Team of the University of Genoa – DISTAV – for all their work in the organisation of the event. During the 10th International SedNet conference in Genoa a first copy of the policy brief was handed over by Marc Eisma, chairman of SedNet, to Raimund Mair of EC-DG ENV – Water Unit, with the request to spread the document to his EC colleagues. The policy brief states that European water policy objectives will only be achieved by also integrating sediment in River Basin Management Planning. Underpinned by the work of SedNet, the Elbe provides now for the first time an example on how to integrate sediment. In the coming period SedNet will disseminate the policy brief to European River Basin Commissions and other stakeholders. Is there enough attention for sediment issues? The conference participants were requested to complete a questionnaire and give their personal opinion on how well sediment issues are integrated in River Basin Management Plans and Flood Risk Management Plans and whether they would like a better integration of sediments in future updates of such management plans. The outcome of the questionnaire was presented on 16 June in the Closing Session of the conference. The majority of the participants indicated that in their country there is not enough attention for sediment issues and that it would be appropriate to develop a sediment management concept for each river basin from which input can be taken to incorporate into the River Basin Management Plans and Flood Risk Management Plans. During many years Peter Heininger has represented the Federal Institute of Hydrology (BfG) in the SedNet Steering Group. Now the time has come that Peter will leave SedNet due to his retirement in autumn 2017. 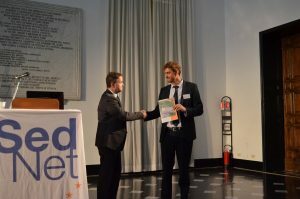 At the 10th SedNet conference in Genoa, Peter presented his farewell speech Small particles, big issue – sediment matters, summarizing the work on a Conceptual Framework for Sediment Management in the Elbe River Basin, and emphasizing the importance of the SedNet network for keeping sediment-management issues on the agenda. Marc Eisma handed a Certificate of Appreciation to Peter Heininger, for his contribution and dedication to SedNet during all these years. SedNet is pleased that the continuity of BfG in SedNet is assured by Vera Breitung, who will take over Peter’s position in the Steering Group. The 10th international SedNet conference, held in Genua 14-17 June 2017, concluded that human interferences have disturbed sediment balances in many river-sea systems, globally and that this has huge impacts to people, profit and planet. SedNet is aware that sediment balances are by nature dynamic balances and that the desired use of the river-sea system to a large extent determines what sediment balance is deemed optimal at which sites. It was also realized that at present there are many pressures, which determine the quantitative sediment supply and demand (and hence the sediment balance) at a certain location within the river-sea system continuum, such as: navigation, climate change, (soil) erosion, (land) reclamation, subsidence, etcetera. Also, changes in sediment erosion and deposition may lead to changes in sediment composition and different behavior. For instance: mud deposition on a river bed may hinder exchange between the water of the river and ground waters. At the moment a lot of research activities are on-going, which are partially also targeted to solutions. However, solutions are mostly focused ‘end-of-pipe’. Actions targeted at, for instance, cyclic use of sediment or source management are rare. Sustainable solutions should be sought at the river-sea-system scale and underlying scales. Up to now, hardly any concerted action is taken on the largest scale, although some examples (Elbe, Oder) show that this can be done, whereas there are also negative examples of situations where the interdependence of the various parts of the river basin and adjacent coasts is neglected (e.g. Mekong). Therefore it was decided during the 10th SedNet conference to establish a dedicated SedNet Working Group for sediment quantity management. The idea is that the Working Group will focus at entire river-sea systems, taking a holistic ‘from the mountains to the sea’ perspective, with a keen eye on stakeholder involvement and striving towards the exchange of best practices. Thus respecting the SedNet key-principles for sustainable sediment management. A proposal for the Working Group is under construction. If you are interested to join the WG, please contact jos.brils@deltares.nl. From 30th June to 4th July, 2017, the 33rd International Conference of the Society for Environmental Geochemistry and Health (SEGH) was held in Guangzhou, China. SEGH was established in 1971 as an interdisciplinary forum for scientists who focus on the interaction between geochemistry and health of the environment, and conferences are organized once a year. As the venue of this year’s conference was in China, most participants came from the Asian sector of SEGH. 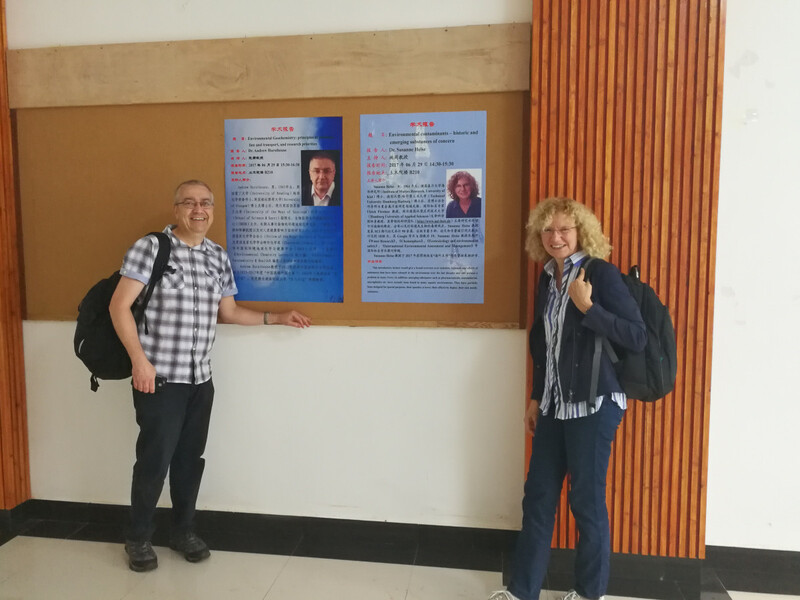 Among the European participants were also Prof. Andrew Hursthouse from the University of the West of Scotland, former SEGH president, and Prof. Susanne Heise from the Hamburg University of Applied Sciences, member of the Sednet Steer Group. 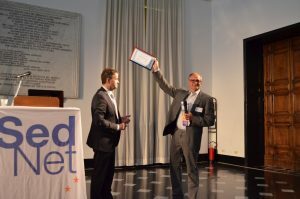 We (Andrew and Susanne) would like to share some impressions from this meeting with the SedNet community. More than 300 oral presentations, organized in 26 sessions, covered a wide range of different topics, comprising new analytical methods, emerging substances (especially nanomaterials and microplastics), explicitly the interaction between environmental geochemistry and human health, sources of pollution, mitigation strategies, geochemical processes, ecotoxicity, bioavailability etc. 16 presentations dealt specifically with sediment issues. Susanne’s point of view: This was my first big conference in Asia and I perceived it like a different scientific world. While quite a few presenters of Asiatic background actually worked in the States or in Europe and some “western” scientists who had been cooperating with Asian colleagues, scientific research in Europe and in Asia in my opinion would both gain from more exchange and networking. In Europe and explicitly in SedNet, we emphasized the need for river basin management, integrated strategies, conceptual models, risk reduction on river basin scale. My impression from this conference and from the conversations that I had during a 4 weeks fellowship in Hunan this year was that a strong focus in China is on research into specific, detailed problems and mitigation strategies, not so much on broader and integrated approaches. I was very impressed with the high quality presentations during the conference and I am certain that more inter-continental cooperation would be very fruitful. Even though scientific knowledge should merge by the means of scientific publications, this is no replacement for personal interaction. Andrew’s point of view: It was very good to have the perspective of many new contributions to the traditional SEGH meeting. The programme was full and rich with input from across the world, but strongly influenced by excellent Chinese-based activity. The SEGH board has been able to sustain a core meeting typically in wider European platform but also with events in USA and in Asia/Pacific. This meeting was established through the efforts of two core Board members from China and their extended networks. The success as Susanne points out was in drawing a range of collaborations already existing and well developed research plans and actions supported by discrete projects, many focused on immediate critical issues of environmental impact. I have been developing links in China through Fellowships supporting activity over the last 4 years from various Chinese Government development programmes. Long term future is to establish core research development – not only of scientific themes but also researcher development. The rapid development of the Chinese economy over a few decades has resulted in many high level, very public environmental problems which may have stimulated the specific issue focus Susanne observed. I fully agree a more systems-based and systematic approach to these problems is needed and maybe led by the deep experience of SedNet and other networks experienced in dealing with the science-policy interface. The long term plans being developed through my collaboration with Susanne fits well with the experience of SedNet and we welcome engagement in opportunities from the wider group. 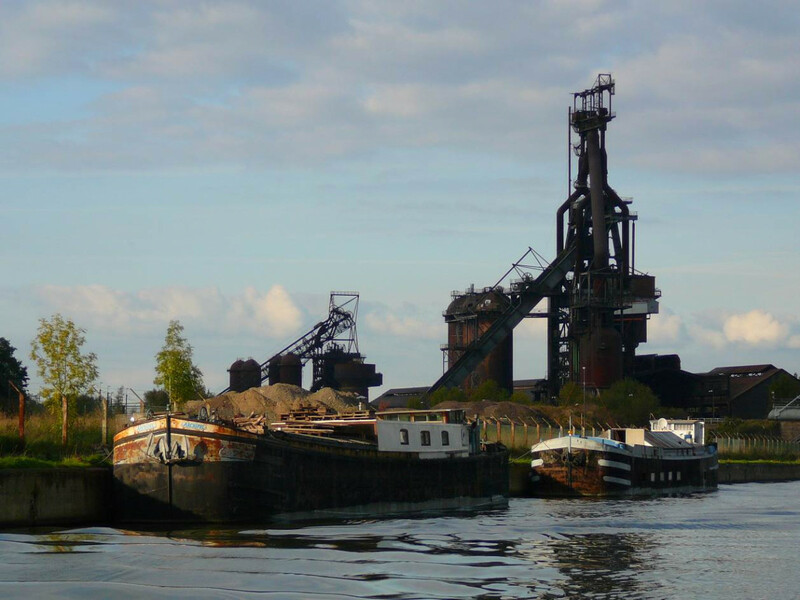 Nine partners and three associated partners from Northern France, Wallonia and Flanders (Belgium) are cooperating under ERDF INTERREG V support and funding to validate and demonstrate sediment reuse options in the Belgian-French transboundary regions. 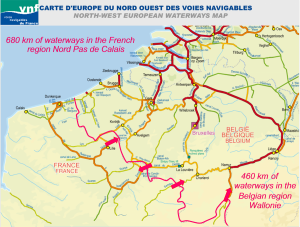 The north of France, Wallonia and Flanders are three European regions with tightly interconnected waterways. The shallow relief results in high sedimentation rates and dredging needs. This may increase in the future with the intensification of rain events, in relation to climate change, favouring soil erosion and leaching. Until now, there are few demonstrated sustainable reuse pathways for dredged sediments. 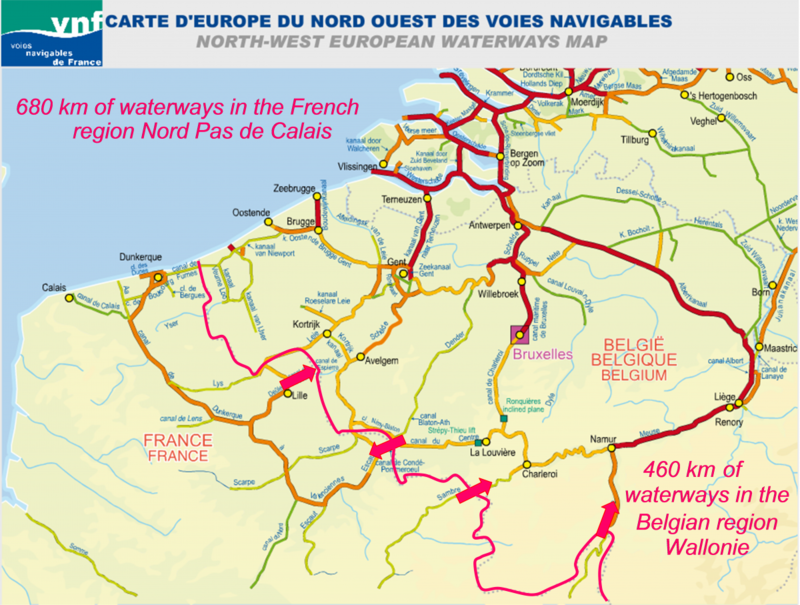 Waterways operators and administrations are still waiting for efficient valorisation solutions. As a legacy from a rich industrial past, these regions are also characterised by urban brownfields to be rehabilitated, generating a large volume of excavated soil that should be managed and valorised. The purpose of the VALSE project is the cross-border validation of material valorisation pathways. Beyond R&D demonstration, this work strives for operationality through full size implementation (landscape mound, cycle path). Such pilot tests improve social acceptance and the good integration and sustainable use of works in territories. The project will contribute to the feasibility demonstration of materials reuse and the demonstration of circular economy benefits. A successful local integration of reused sediments also implies the observation of old sediment disposal sites, taking into account the relationship between environment and health, as well as the environmental impacts. The integration of reused sediments needs also to establish a strong relationship between available sediment resources and the needs of major projects within the France-Wallonia-Flanders territory, especially for civil engineering. Material valorisation remains a challenge in several engineering areas, and the VALSE project is committed through the development of measurement tools for matrix environmental characterisation and the implementation of sustainable and innovative concrete formulation technologies, cement manufacturing for civil engineering and aggregate production for building insulation. VALSE’s approach, in keeping with a spirit of sustainable development and circular economy, will be disseminated to a wide audience to promote sediment reuse. It will contribute to the preservation of waterways through integrated sediment management, material valorisation and their integration into the territory, according to the strategic axes of the INTERREG V program. The Portuguese Environment Agency [http://www.apambiente.pt/index.php?ref=x178] will develop a project to evaluate sediment sources offshore (between -20m CD (closure depth) to -35m CD) to identify borrow areas for high magnitude beach nourishment operations in the western coast of Portugal. The project, designated CHIMERA, is part of the ongoing sediment management strategy and policy, assuming the replacement of the sediment budget as the main coastal protection measure in areas with large background erosion. Further information is available at the article “Upstream public engagement on coastal issues: Audience response to a science-based exhibition” published in the international journal Ocean & Coastal Management (http://www.sciencedirect.com/science/article/pii/S0964569116303143 ). The outcomes of the Navigating a Changing Climate conference – subtitled ‘Moving towards low carbon and resilient waterborne transport infrastructure’, which was held in Brussels on 27th and 28th March 2017, can be found on http://navclimate.pianc.org/news or go straight to https://drive.google.com/file/d/0B7BzhazI9p3-ZTdtZ1NzWURkSkk/view. You will find all key messages, abstracts, PowerPoint presentations and video recordings via these links. On 17-22 June this year, Prof. Susanne Heise (Hamburg University of Applied Sciences and member of the SedNet Steering Group) attended the 14th international conference on sediment-water interactions (IASWS) in Taormina, Sicily, and presented the results from the Sednet workshop on the theme “when soil becomes sediment and sediments become soil” that we held last year in Germany. As there is little overlap between the IASWS and the SedNet community, the incentive was to raise awareness on the partly contradicting and confusing definitions of soils and sediments and point out potential consequences for regulation and management. The presentation is available on the SedNet homepage under https://sednet.org/wp-content/uploads/2017/09/Presentation-On-the-relevance-of-sediment-soil.pdf, so please have a look if you are interested in this topic. There is a Linked-In discussion group on this issue (to join, please send a note to “susanne.heise(at)haw-hamburg.de”). The workshop participants are currently working on a manuscript discussing the various aspects of the sediment-soil issue in detail, so please stay tuned. 18-20 September 2017: 20th International Riversymposium and Environmental Flows Conference, Brisbane, Australia. More info: website. 20-23 September 2017: 15th “EUROPE-INBO 2017” International Conference for the implementation of the European Water Directives, Dublin, Ireland. See for more info the website. 11-13 October 2017: IMEKO TC19 Workshop on Metrology for the sea “Learning to measure sea health parameters”, Naples, Italy. 13 October 2017: Weg van sediment / (a)Way of Sediment. A one-day event organised by CIW Waterforum in Brussels. Language used will be Dutch most of the day, but presenters will be asked to provide sheets in English. Keynote speaker Peter Heininger of the German Federal Institute of Hydrology (BfG) will give a presentation (in English) about the sediment management concept that has been developed for the Elbe river. More info on the event-webpage. 9-10 November 2017: The GLOBAQUA project organises a workshop entitled “A Reconnaissance of Trace Organic Compounds and Metals in GLOBAQUA River Basins: Effects on ecosystems and risk assessment”, Barcelona, Spain. 4-8 June 2018: 3rd edition of the I.S.Rivers international conference on integrative sciences and sustainable development of rivers , Lyon, France. Call for papers is open now. You can send a “declaration of intent” until 15 October 2017, and an extended abstract until 20 November 2017. See conference website.